She looks lovely! The color is so refreshing to see after all the beige/black/white crap of Middletrash. Oh I love the necklace!!! Although I think it doesnt really match the dress. OH my lord! Caroline and Stephanie do not look they are having a good time. Mind you they often look like that. 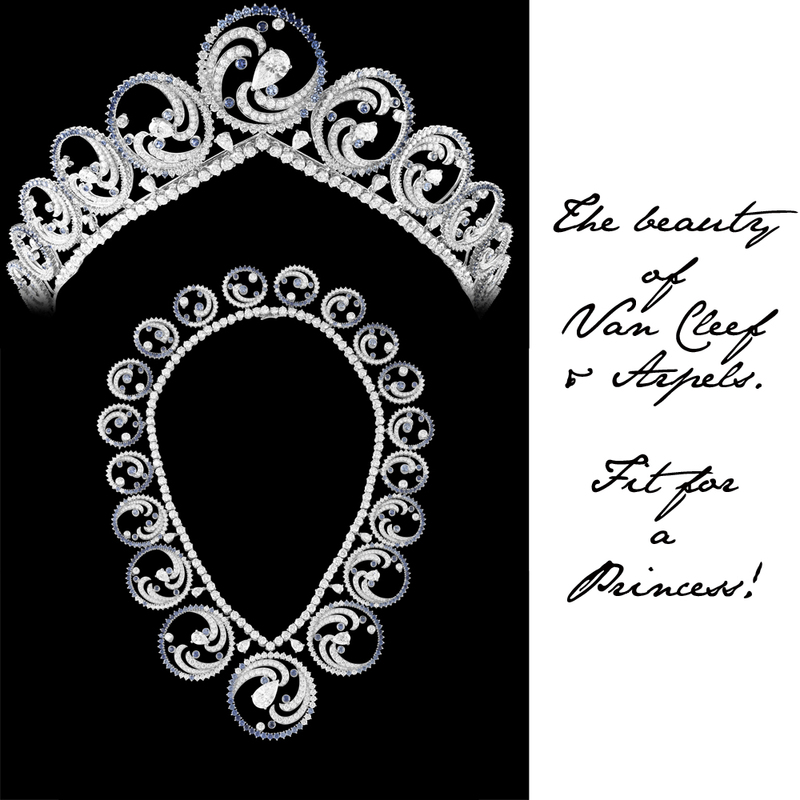 The necklace can also be worn as a tiara! She shouldn´t try so hard to be a fashion icon. Too much IMO. I love that colour. Now I would love to see Charlene with a dress that will harmonize the size of her hips and her shoulders. And I think V-neck/Scoop neckline may suit her best. The Princess looks much more relaxed and happier. I wonder if the DNA results already came out and the results were negative. I hope so! Caroline has always been snooty, but I think she looks upset because she is now in the background of things in Monaco instead of First Lady of Monaco. I didn´t find that Caroline looked pissed off. Stephanie looks always miserable. This ball reminds me of a local event, it´s not the same anymore. No, it's not what it used to be. Amazing color to her dress. Indeed the Red Cross Ball used to be about the cream of the crop and now it looks like any other Monaco event.This wedding has not brought the glamour that Albert so desperately wanted.I never understood why the Grimaldi's walk around like they have responsibilities. I really like that dress. All the rest of you guys are right, but that's one beautiful gown and expertly tailored. Charlene always looks like someone just killed her puppy, tho. 'Don't understand that. I never understood why the Grimaldi's walk around like they have responsibilities. It's just the Grimaldis putting on airs; I mean, really, these people are the most shamelessly scandalous, yet even Caroline acts as if she can walk on unmelted butter. As for the Ball, it no longer attracts the world's movers and shakers because there is no one in the Grimaldi family that really mingles in that aspect of the world. they do not really work in any field that is high level, be it business or diplomacy and they aren't as much of an attraction these days as they used to be in the days of the Eighties and nineties. Grace Kelly has been dead for up to thirty years now and she is not as relevant as she used to be. There is no way that ALbert is anything other than a dirty old man and while a lot of royalties went to the wedding and reception, they all seemed to leave mighty quick after and haven't invited the Princely couple to their estates and Palaces for a social/official event. And Charlene seems that she is not interested at all in Monaco, just what she can get. Yep, Rainier was astrict ruler, but at least the Monégasques trusted him. The Monégasques should have a democratic government. It´s time IMO. Albert is a weak ruler and too much focused on himself And Charlene seems that she is not interested at all in Monaco, just what she can get. Yep, Rainier was astrict ruler, but at least the Monégasques trusted him. Quite right. The Grimaldis are way too scandalous and pleasure loving to properly run a country and there is far too much chaos. None have discipline really and none seem to be interested in Monaco or bringing prestige to Monaco. As for Charlene, give her time and things will likely work out. I agree, I think Princess Charlene will be fine. The problem I see is Pr.Albert needs to buckle down and behave like a seriously ruler on the Throne. All the problems are brought on by the Grimaldi's not Charlene, they are the ones with all the scandal, imo she's the one bright light there and if Andrea, Charlotte and Pierre behave responsibly and one day marry good partner's the Princibality can thrive. I believe a lot of the problems are Albert, Caroline and Stephanie's scandals over the past three decades, now Prince Albert has married and needs a firm hand, maybe his advisor's will assist the new First Lady of Monaco and help. So far imo Charlene is doing a fine job.